To look at these two pictures closely, you'd almost think there have been two different cathedrals. One photograph shows a brick church built in an ornate French Gothic style, a large stained-glass window gracing the front wall. The other shows a church built of bright Wisconsin Lannonstone, its style the more streamlined German Gothic. The window has been replaced by a statue of the Virgin Mary. 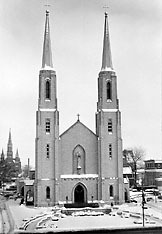 The most visible church in this ``city of churches'' is the Cathedral of the Immaculate Conception, which has experienced its share of architectural transfigurations since it was dedicated in 1860. 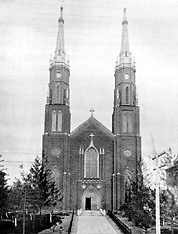 The Cathedral - the first of Fort Wayne's Catholic churches - was designed by Father Julian Benoit, a Frenchman who came to Fort Wayne in 1840. The first brick was laid on July 10, 1859. Fifteen months and $54,000 later, the Cathedral was completed. About $50,000 worth of remodeling was done in 1897, and during the 11-year tenure of Monsignor John R. Quinlan (1910-1921), the original brick exterior, which had started to corrode, was replaced with an imitation rock face of molded cement. By the late 1940s, though this ``sham-rock'' as it was sometimes called began to fall off and constituted a hazard to the public health. To correct the problem and to harmonize the Cathedral with the new MacDougal Chapel going up in Cathedral Square, Monsignor John Dapp began the renovation project which gave the church the face it wears today. Between 1949 and 1950, huge wooden scaffolds obscured the old Cathedral, as most of the old cement covering was removed and replaced with 2,000 tons of stone from Wisconsin and Indiana quarries. The stone was anchored to the original bricks and was built on its own foundation. The stone refacing cost $256,649 in 1950 but would cost an estimated $1.3 million today. The Cathedral's twin spires - its most unique feature - were also altered. But despite all the changes over the years, the spires - and the Cathedral itself - remain a recognizable landmark in a downtown which is constantly changing.